• Was the patient positioned straight? • Is the trachea narrowed and/or displaced? • Does the mass pulsate under fluoroscopy? • Is the mass located anteriorly or posteriorly? With regard to the etiology of masses in the anterior upper mediastinum, the famous "4 Trule" applies: thyroid, teratoma, thymus, and . . . terrible lymphoma. Truly Large or Just a Matter of Unfortunate Perception? Robert Waggoner (36) has recently noticed a swelling of his neck. While jogging in the morning he becomes short of breath pretty early these days. The enlarged veins at the neck get in the way of his wet shave. His family doctor has sent him for a chest radiograph on short notice. Joey studies the CXR together with Hannah (Fig. 6.59). The upper mediastinum is definitely widened—Mr. Waggoner has been perfectly positioned for the film. The trachea is stenosed. Both students contemplate the range of differential diagnoses. Fig. 6.60 The upper mediastinum is widened, the trachea is compressed by the goiter. Calcified thyroid nodes are not seen. 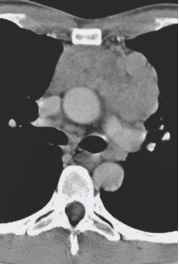 Goiter: Enlarged thyroids are the most frequent masses in the upper mediastinum (Fig. 6.60). They can become enormously large, displace and narrow the trachea, and lead to dyspnea on exertion. Typically they move up and down during swallowing. 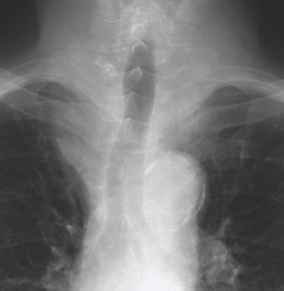 Frequently nodules develop inside the goiter that calcify coarsely and can become visible on the CXR. Lymphoma: Lymphomas may occur in the upper mediastinum, where they displace the trachea and the vessels. Occasionally a superior vena cava syndrome results that needs therapy fast (and best after sufficient histological samples have been collected by CT-guided core needle biopsy). Naturally, enlargement of the lymph nodes may also be due to inflammatory processes, for example, tuberculosis or sarcoidosis. Teratoma: Teratomas may consist of all elements of the blastodermic layer and therefore can contain fat, rudimentary teeth, and bones (Fig. 6.61). If you unequivocally find any or all of these features on a CT, the diagnosis is a quick and solid one. Fig. 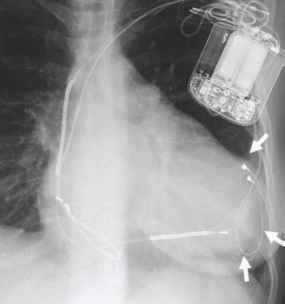 6.61 a The P-A radiograph of the chest shows a mass projecting below the azygos angle (arrows). b The lateral view reveals the anterior location of this partially calcified lesion (arrows). Even if we do not see any teeth, this is a teratoma. Fig. 6.62a You see a large aneurysm of the aortic arch that follows the course of the aorta and that would pulsate strongly at fluoroscopy. b The lateral view demonstrates the ventral displacement of the trachea (arrow) as well as the pressure erosion of the spine. c In CT these alterations are even more impressive. Thymus/thymoma: The thymus is large in small children. However, it does not displace the trachea because it is too soft. Its size decreases slowly into adulthood and it may remain visible as a triangular structure in the anterior mediastinum in young adults. This residual thymus can cause problems in lymphoma management: Under chemotherapy lymphoma masses shrink, as does the healthy but stressed thymus. As the therapy is concluded, the thymus recovers and may become larger than before; this "thymic rebound" must be differentiated from residual lymphoma or lymphoma recurrence. Clinically, primary tumors of the thymus are frequently associated with syndrome of myasthenia gravis. Aortic aneurysms: An enlargement of the upper mediastinum can be caused by aneurysms of the aorta and its brachiocephalic branches (Fig. 6.62). These lesions tend to be pulsatile and are located in the middle mediastinum. Achalasia: Certainly diseases of the esophagus can become noticeable on the CXR. They tend to be located in the posterior mediastinum. Particularly impressive is the dilatation of the esophagus, often with impacted food in achalasia (Fig. 6.63).
! Achalasia is a premalignant disease. • Diagnosis: Joey schedules Mr. Waggoner for the next available CT slot (Fig. 6.64). He and Hannah check the CT images and are absolutely convinced that this is a case of superior vena cava syndrome due to lymphoma. They organize a CT-guided biopsy for the same day before the preliminary therapy is started. Fig. 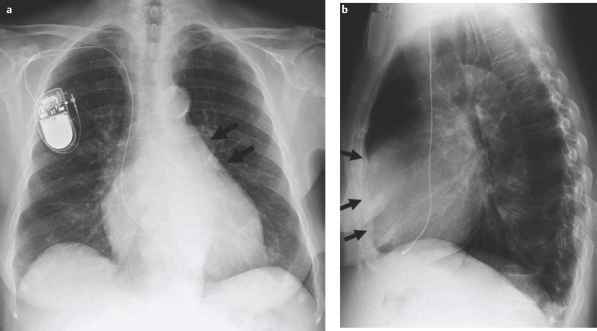 6.63 The markedly dilated esophagus in the posterior mediastinum is partially air-filled (a), partially filled with residual food (b, arrows). If you see a mass on a radiographic study, ask yourself: Which normal structures in the region could be the source or starting point of the lesion? This approach will jog your mind and help develop a meaningful differential diagnosis. • Is the heart contour altered in a typical fashion? • Does the mass contain air? • Does the mass contain calcifications? Fig. 6.64 Multiple confluent, enlarged lymph nodes are located in the anterior mediastinum. The interventional radiologist will advance the biopsy needle next to the sternum on the left to get a tissue core. Cardiomyopathy: Generalized enlargement of the heart is often due to cardiomyopathy, which may be caused by chronic severe coronary artery disease, can occur as an idiopathic entity, or may be caused by a variety of toxic agents such as alcohol or drugs (Fig. 6.66). 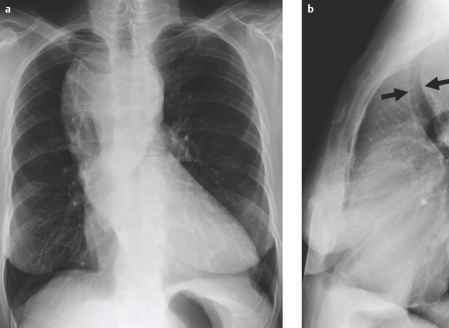 Pericardial effusion: A pericardial effusion can enlarge the heart silhouette in all directions. 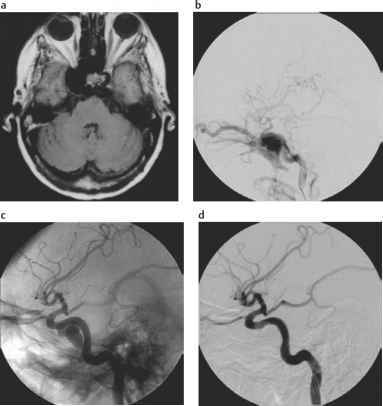 It is best verified with CT (see Fig. 14.29f, p. 327) and, of course, echo-cardiography. Fig. 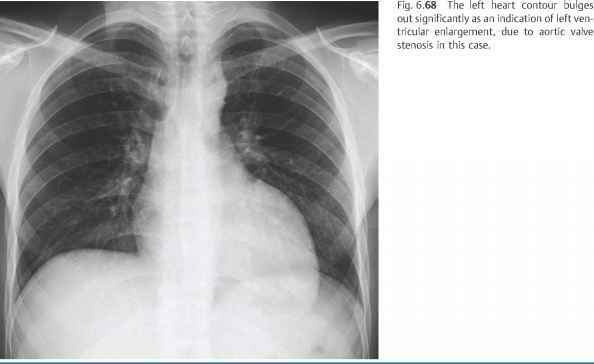 6.65 You see the CXR of Mrs. Myers. What grabs your attention immediately? Can you call the final diagnosis already? Fig. 6.66 This heart is enlarged as a whole. 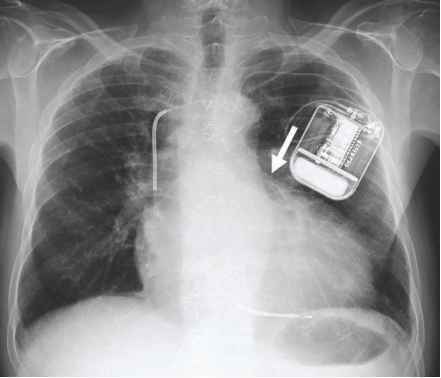 Coronary artery disease has already necessitated prior stent placement (arrow); arrhythmias have required the implantation of a cardiac defibrillator. Fig. 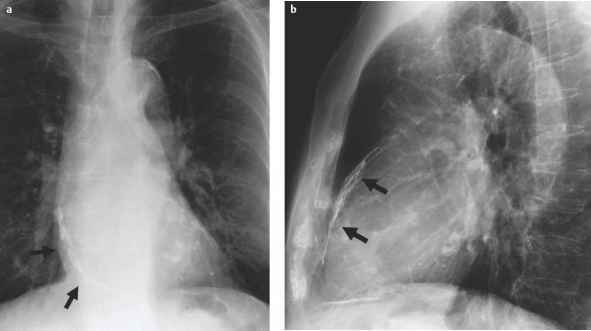 6.67 Coarse calcifications (arrows) outline the pericardium in this patient. The pericardial mobility is consequently restricted ("Panzerherz"—now how's that for a German term?). Fig. 6.69 The flattening of the heart concavity (a, arrows) and the enlarged contact area to the sternum (b, arrows) suggest right ventricular enlargement (see Fig. 6.1). 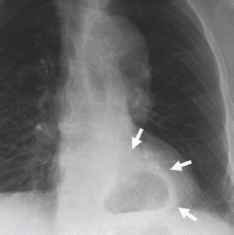 Constrictive pericarditis: Constrictive pericarditis is a postinflammatory entity characterized by pericardial calcifications visible especially in the periphery of the heart shadow (Fig. 6.67). 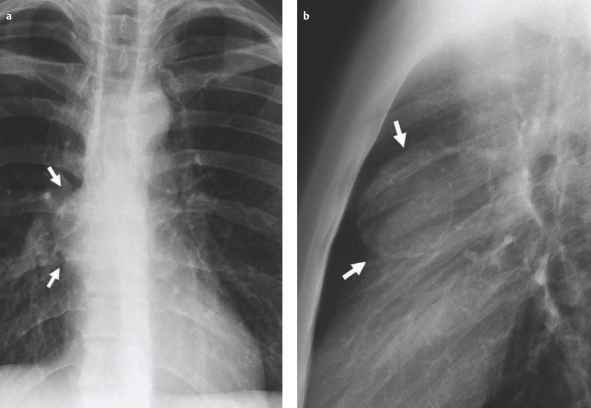 Valvular calcifications: Calcifications of the heart valves are best appreciated on the lateral views of the chest and can be assigned to the individual valves (see Fig. 6.2b). Left heart enlargement: Left heart enlargement causes an abnormal but smooth bulge of the left lower heart contour. It occurs in left ventricular hypertrophy, as is seen, for example, in chronic arterial hypertension or in aortic valvular stenosis (Fig. 6.68), and in left ventricular dilatation, for example, in patients with aortic valve insufficiency or decompensated left heart failure, often due to severe coronary insufficiency. In arterial hypertension the left ventricular hypertrophy is frequently associated with an elongation of the aortic arch. Right heart enlargement: Right heart enlargement manifests itself as a flattening or a bulge of the normally concave left upper heart contour. In this location, the pulmonary artery is displaced upward and laterally by the enlarged right ventricle. The enlarged right ventricle occupies the retrosternal space, which is well appreciated on the lateral CXR (Fig. 6.69). If the ventricle is hyper-trophic but not enlarged as in pulmonary hypertension due to pulmonary fibrosis, the pulmonary artery is dilated centrally. The result is the typical appearance of a cor pul-monale (see Fig. 6.75). Left ventricular aneurysm: A left ventricular aneurysm may develop after an extensive coronary infarction. It appears as a circumscribed bulge of the heart contour (Fig. 6.70). Fig. 6.70 The balloonlike bulge of the left heart contour (arrows) is a left ventricular aneurysm complicating extensive myocardial infarction. Fig. 6.71 a The atypical shape of the heart (do you see the bulge of the left heart contour?) and the obliteration of the right heart contour ("silhouette sign"?) make sense only after inspection of the lateral film. b The sternum (arrow) is located a few centimeters ventral of the spine in funnel chest (pectus excavatum). Of course, the heart is heavily deformed to fit into this chest. 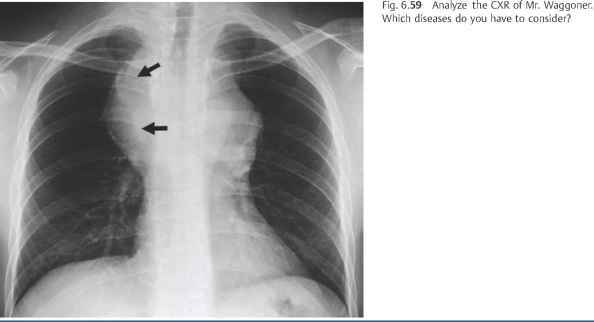 Funnel chest (pectus excavatum): A funnel chest can deform the heart silhouette significantly; the underlying sternal deformity can best be identified on the lateral CXR (Fig. 6.71). Fig. 6.72 The air-filled thick-walled structure is projecting over the heart shadow (arrows). This is a large hiatal hernia. 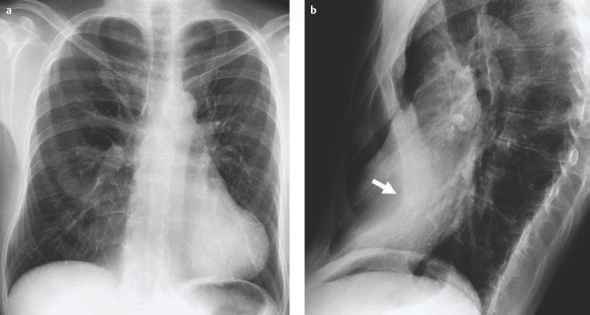 Hiatal hernia: This entity is the most frequent incidental mass in the retrocardiac space (Fig. 6.72). Owing to its air content and thick wall it is recognized with ease in most cases. If verification is needed, a lateral chest radiograph after ingestion of a small amount of barium will prove the hernia. It must, however, be differentiated from diver-ticula of the lower esophagus. • Diagnosis: Giufeng has already seen some hiatal hernias and, as a matter of fact, did not really consider any alternative diagnosis in this case. For Mrs. Myers there won't be any consequence if she has no related complaints. f The analysis of a complex heart configuration on a CXR i needs a lot of time and brains and is hampered by a large number of variables. It is a first-rate intellectual challenge. Fortunately for all of us who do not play chess, echocardiography offers answers in less time and with more reliability. In the good ol' days there was more time for analysis—and no alternative. 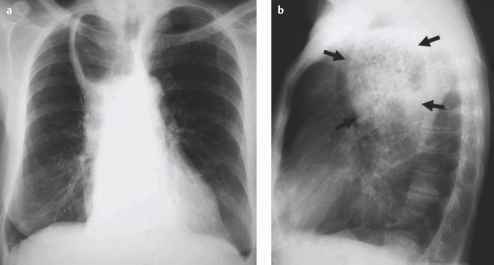 The typical heart configuration on a CXR should, however, be recognized and called by its right name. Benjamin Felson was a grand American lecturer and a witty, inspiring radiologist. If you ever get a chance to read his book on chest radiology, go for it. In it he narrowed down a rather long radiological differential to two entities. Of these he picked one because the other one was "about as rare as a funnel chest in the Italian film colony." Which tells you a lot about humor and Italian movies in the sixties.